Tonight I felt like having something cheesy, warm, and baked. 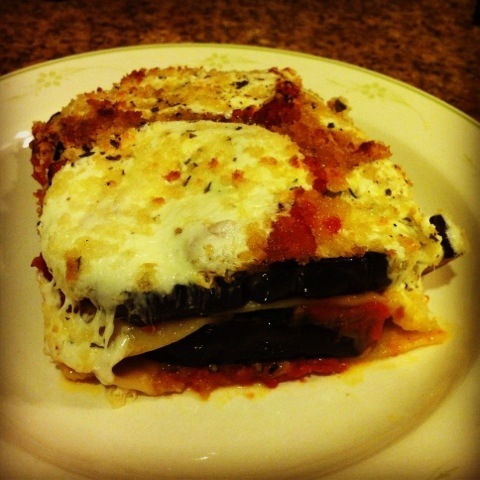 This vegetarian lasagna is still hearty (due to the eggplant) and is quite easy to make. You can make this with whatever veggies you have in your fridge (mushrooms, broccoli, bell peppers, etc) and it will still come out yummy! I’m using fresh mozzarella slices instead of ricotta because I already had them at home, but feel free to change up the recipe to suit your tastes and fridge ingredients! I’m making the tomato sauce from scratch (it’s so easy!!) but you can easily substitute jar tomato sauce, although I discourage you from doing so. Try making the sauce at home–it tastes a thousand times better and it’s fresh! One of the best cooking smells, at least for me, is a tomato sauce simmering on the stove. It creates such an inviting, homey smell! Place your onion in a small pot and cook for 3-5 minutes over high heat with some olive oil. Lower your heat to medium and add 2-3 cloves of chopped garlic. While it’s cooking for a few minutes, cut up your tomatoes. I cut them into pretty big chunks because they’re going to cook down anyway. Throw them in the pot, sprinkle them generously with kosher salt and pepper and let it simmer. After about 10 minutes, you’ll see the tomatoes start to break down and you can help them along by breaking them up with a wooden spoon. Once your sauce has reached the desired consistency remove it from the heat and throw in some chopped basil. Take your eggplant slices and sprinkle them generously with kosher salt and let them sit for 10-15 minutes. You can do this before you start the tomato sauce if you want. This will draw out all the water from the eggplant so it won’t end up in your lasagna. Once the water has risen to the surface of the eggplant (you’ll be able to see the water droplets) brush off the water and salt with a papertowel. Now you’re ready to assemble the lasagna. Take a baking dish and coat the bottom with a layer of tomato sauce. Place the no-boil noodles, a layer of eggplant, a layer of zucchini, and a layer of mozzarella. Then continue the layering process until you’ve reached the top of the baking dish. Finish with a layer of the tomato sauce and drizzle with some olive oil. 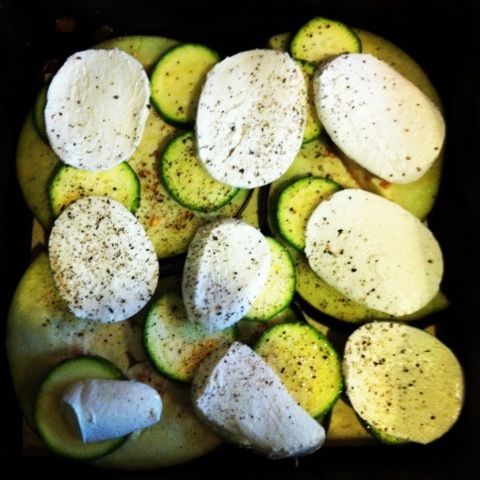 Leave some room at the top of the baking dish because later you’ll add a final layer of mozzarella and the bread crumbs. Cover with aluminum foil and place into a pre heated 375 degree oven for about 20-30 minutes. Just keep checking the veggies to see if they’re soft enough. Once it’s done, take it out and place a layer of mozzarella on top, sprinkle the bread crumbs and parmesan cheese and drizzle with a little more olive oil. Throw that sucker under the broiler for 3-5 minutes or until the breadcrumbs get crispy and voila’! Salting the zucchini and letting it sit for a half hour or so to get rid of the excess water, will make it a bit firmer when cooked. Never the less, I really like this recipe. Keep it up, girl! Looks amazing, Thank you for the post! Thanks!! It was quite delicious, let me know if you try it out! Send it here girl. Send it here. How was your trip????? ?